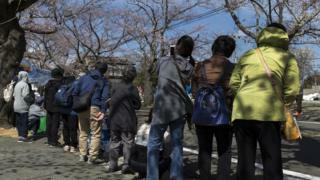 A Japanese town whose population fled the 2011 Fukushima nuclear plant disaster has partially reopened eight years later. Radiation levels in parts of Okuma, west of the Daiichi plant, have been deemed safe for residents to return. About 50 people have begun moving back to areas in the town where decontamination efforts were focused. The plant was hit by a tsunami, causing the most serious nuclear accident since Chernobyl. Critics have accused the Japanese government of expediting residents' return in an attempt to showcase safety standards ahead of the 2020 Tokyo Olympics. Okuma's 10,000 residents were among nearly half a million people to flee the region after the disaster. BBC Tokyo Correspondent Rupert Wingfield-Hayes says the vast majority of the town's original inhabitants are unlikely to go back. Only 367 people - around 3.5% of the town's original population - had registered as residents as of late March, local reports said. Japanese authorities are hoping new infrastructure, including a town hall and state-owned housing, will attract residents to return. However radiation remains a major concern for residents, especially those with children. A survey by Japanese newspaper the Asahi Shimbun found just over half of residents in Fukushima Prefecture felt that progress has been made toward recovery. How deadly was the disaster? The 2011 Fukushima disaster saw three reactors of the nuclear power plant, some 62km (39 miles) south-east of the city of Fukushima, fail after it was damaged and flooded in the tsunami. The accident forced more than 470,000 people to be evacuated because of nuclear contamination concerns. Just under 18,500 people were killed or went missing after an earthquake triggered the massive tsunami that led to the meltdown. Though no-one died as a direct result of the nuclear meltdown, plant operator Tokyo Electric Power Company (Tepco) has paid out compensation to some of those affected. More than 40 patients had to be evacuated from a hospital in the area and later died, while other deaths have been linked to the trauma suffered by those who lost their homes and loved ones. In 2017, three former Tepco executives went on trial charged with professional negligence linked to the hospital evacuation.